There are tons of books and articles about leaving the past behind us and some of us might not quite understand what that actually means .. or what it can mean. Some of my most inspired heartistry has come rushing in on the waves of ‘remembering’. I’m a softy for nostalgia and an intrepid time traveler. I often find myself sweetly reflecting on days gone by, dusting off a memory and using it to create something in my present .. YES, I am wonderfully grounded in my ‘now’ with visions ahead of me, a map to keep me in step along my journey AND I know what to ‘keep’ from what’s happened behind me. I write odes to the past, not IOU’s. I’ve traveled so far in this life and there are some very sweet treasures in some of that luggage that I’ve brought along beside me, but to see this, I had to be willing. I had to be brave! The important thing to remember is just like rummaging through the garage on cleaning day or a dusty old attic, think about what you want to keep and what you will do with it. Closing up that garage or boarding up that attic, isn’t going to make the contents go away and the same is true for your mind! It takes a brave soul to be willing to look in all those nooks and crannies but I know that as a heartist, you have what it takes to do just that. Look at the past and sort your antiques from your trash and then decide what trash can be transformed into treasure. In your new creations, you won’t need to hold onto the junk anymore. I re-purpose tangible things all the time .. a broken plate becomes a mosaic, an old canvas can be repainted over and over again .. our tears can be unwanted, rusted stains or honored as timeless patina. I do the same thing with my past! I take a sweet tidbit and sometimes, something not so sweet and I create a brand new, meaningful art piece in my now that inspires me and lights my way in my future. An ode to the past is not a martyr to the past .. it’s not anything being owed to the past or sacrificing your present or future happiness for the sake of it. What memory can you re-purpose? What can you re-create? Somewhere amid all those fragments, you will find your most beautiful and touching heartistry and all you need is the will and the want, to re-create it. Simply pick it up with compassionate hands, a brave heart and soft eyes .. then give it a look from a different angle. You will see the possibilities, the new light transforming ages of old into your own sacred treasure trove and with a little love of your artist hands .. you just might inspire someone else along your way! 1. a lyric poem typically of elaborate or irregular metrical form and expressive of exalted or enthusiastic emotion. 2. (originally) a poem intended to be sung. 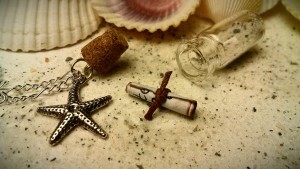 The art picture here is my ‘Message In A Bottle’ necklace ~ a perfect way to remember and recognize. To see more of my heartistry ~ Visit My Shop!